Reno Miller (Abel Ferrara) is an artist in a rundown part of Manhattan. He lives with two women, Pamela (Baybi Day), and Carol (Carol Slaughter). The trio are barely scraping by and struggle to keep their apartment and pay the phone bill. Reno has an offer for a painting he’s working on, but he won’t sell until it’s ready. To make matters worse, a noisy band called the Roosters have moved in next door and the landlord will do nothing about it. The pressures of his life begin to dig at his sanity, and eventually Rooster stalks the streets at night murdering homeless men with an electric drill. 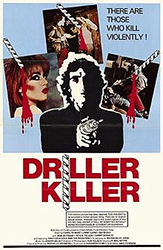 An early feature by the man who would later direct Bad Lieutenant (1992), The Driller Killer is a gritty black comedy with more than few arty moments. The dialogue is very naturalistic and it’s often difficult to pick out what people are saying. The grime of the city and its denizens feels authentic. The cacophony of the Rooster’s arty punk music fits the environment perfectly. The movie is happy to just have its characters ramble about while Reno’s murderous inclinations bubble under the surface, and it’s fascinating to watch. The comedy arises from all these strange obsessed characters rubbing each other the wrong way, the violence rises from the same source. I went in to this film expecting a pretty typical 70s style slasher only to be impressed by its wry sense of humor and its more arthouse leanings. The Driller Killer was an unpleasant surprise in the best way.